Has anyone been to this campground? We are thinking of staying here to visit st louis, and go to a ball game. or are there better options? That's a long way from downtown St. Louis. I believe most of us stay at the Casino Queen RV Park just across the river in East St. Louis. It's not inexpensive but then neither is a KOA. Casino Queen, Cahoika RV Park, or the St Louis RV Park would be the closest camping areas to the stadium, with Casino Queen the nearest and probably most convenient of the three. I think they may even have shuttle bus service sometimes. 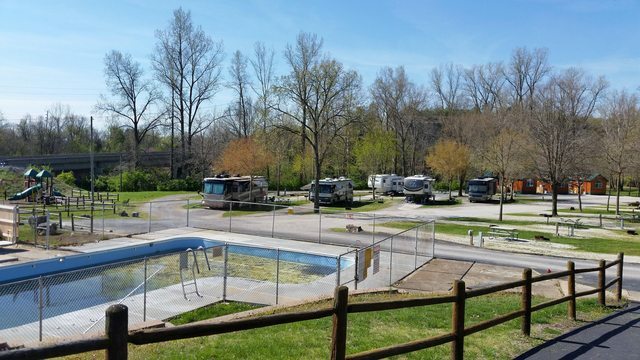 St Louis RV Park is reportedly in a slightly rough neighborhood, though it doesn't look terrible to me on google maps etc. Casino Queen RV Park is basically a glorified parking lot with full hook-ups and a few small trees. It is my choice if visiting St. Louis is your goal. They do sometimes offer shuttle service to the ballpark, or the security van will shuttle you up to the train station adjacent to the property and you can ride right to Ballpark Village and many other destinations. When you return to the train station just phone them and they will pick you up and shuttle you back to your campsite. They were very accommodating when we have been there. 35 miles from Normal, IL. As close to normal as I'll ever be. We like 370 Lakeside CG in St Peters.. Easy to get downtown, easy access to public transportion. The park is new so no shade. There is a nice lake and biking/walking trails. We stayed there on our retirement trip 3 years ago. It's convenient to the Six Flags. A typical KOA, it was well kept and the staff was friendly. This was taken in April. Casino Queen RV Park does not open until April. They are very accessible to downtown St. Louis.